Screening and prophylactic treatment for hepatitis B virus (HBV) reactivation is recommended for patients who receive immunosuppressive or cytotoxic therapy. The aim of this study was to clarify the prevalence of HBV reactivation in rheumatoid arthritis (RA) patients who had received more than 1 year of immunosuppressive therapy. This study also evaluated guidelines for determining HBV reactivation in patients with RA. This was a prospective non-randomized, non-controlled study. We enrolled 50 patients with RA who had antibodies against hepatitis B core antigen (anti-HBc) and who had started treatment with disease-modifying anti-rheumatic drugs, including those who had additionally received anti-tumor necrosis factor-α (anti-TNF-α). HBV DNA levels were measured every 2–3 months by a real-time, polymerase chain reaction-based method. Entecavir was administered to patients with HBV DNA levels >2.1 log/ml. The mean observation period was 23 months (range 12–32 months). HBV reactivation occurred in 2 of 5 patients with HBV surface antigen (HBsAg) and in 1 of 45 patients without HBsAg. In patients who received anti-TNF-α therapy, antibodies against HBsAg decreased significantly. Entecavir therapy inhibited HBV amplification and prevented HBV-associated flares of hepatitis. The incidence of HBV reactivation was low in RA patients in whom HBV infection had been resolved. 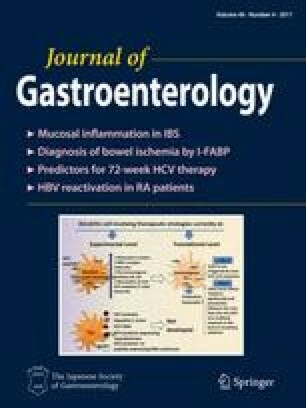 Screening for HBV reactivation and prophylactic therapy with entecavir were effective means of preventing HBV-associated hepatic failure in patients with HBsAg, as well as in those with only anti-HBc who received immunosuppressive therapy for RA. We thank Ms. Rie Yasuda and Ms. Sanae Deguchi for their assistance in data/sample collection. This work was supported by the Liver Disease Research Fund in Osaka City University Graduate School of Medicine. All authors declare that we have no conflict of interest in relation to the submission of this manuscript. Kuroda T, Wada Y, Kobayashi D, Sato H, Murakami S, Nakano M, et al. Effect of etanercept and entecavil in a patient with rheumatoid arthritis who is a hepatitis B carrier: a review of the literature. Rheumatol Int. 2010. doi: 10.1007/s00296-009-1344-2. Pyrpasopoulou A, Douma S, Vassiliadis T, Chatzimichailidou S, Triantafyllou A, Aslanidis S. Reactivation of chronic hepatitis B virus infection following rituximab administration for rheumatoid arthritis. Rheumatol Int. 2009. doi: 10.1007/s00296-009-1202-2. Urata Y, Uesato R, Tanaka D, Kowatari K, Nitobe T, Nakamura Y, et al. Prevalence of reactivation of hepatitis B virus replication in rheumatoid arthritis patients. Mod Rheumatol. 2010. doi: 10.1007/s10165-010-0337-z.